Turner, Haag, Ehrke and DeBruin are 2011 Friends of Expo honorees. The annual "Friends of Expo" reception held Dec. 1 at the Alliant Energy Center in Madison, gathered a record number of volunteers that assist in implementing the world-class dairy industry show. Two hundred and nine guests attended the Asian-themed volunteer appreciation dinner and celebrated another successful 2011 World Dairy Expo. Four "Friends of Expo" were honored that evening as outstanding volunteers. 2011 HONOREES: Volunteers recognized at World Dairy Expo's 2011 Friends of Expo Party included from left to right: Maureen DeBruin, Brenda Lee Turner, Julie Ehrke and Betty Haag. The individuals who were honored for their years of support and outstanding service to World Dairy Expo were selected from over 400 volunteers who help run the cattle shows, commercial exhibits, youth contests, school tours, Purple Cow Gift Shop and educational venues during the five-day show. 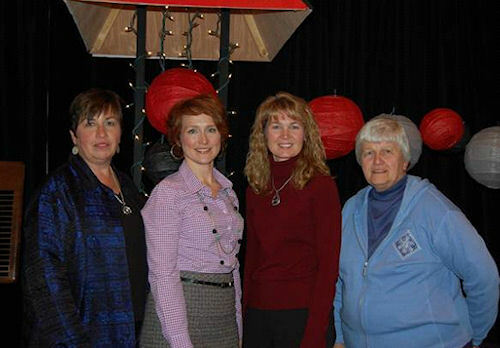 The 2011 Friends of Expo honorees include: Brenda Lee Turner, Betty Haag, Julie Ehrke and Maureen DeBruin. Brenda Lee Turner was presented a Friend of Expo Award for her many years of service to the cattle show. A northern Wisconsin native, Brenda was active showing cattle through 4-H at the county and state level. As a graduate of the University of Wisconsin-Madison, with a degree in agriculture journalism agriculture, she was active in the Badger Dairy Club. Her career path following graduation included working for a prominent breed publication and assisting with dairy cattle preparation and programming for some of the biggest Holstein sales in the world. After marrying her husband, Roger, Brenda now works for Semex in Canada. She is one of the organizers that sets up, manages and disassembles the Semex Walk of Fame live cattle display at World Dairy Expo. She continues to coordinate the grand opening of the World Classic sale with Tom Morris. She volunteers as the official announcer of the International Holstein and International Ayrshire Shows and she suggests story ideas for the Daily Edition. Betty Haag was also honored for her passion as a volunteer for Expo. She grew up on a farm in Milton and was an active 4-H member. As a graduate of Whitewater State College, she received her degree in education and taught elementary school in West Allis. Her desire to return to rural life lured her to earn a home economics degree at University of Wisconsin-Madison and then on to become a county agent in Green Lake. Later she moved to become the Extension home economist in Jefferson County, working with adults and youth for over 32 years. During that time, Betty and her husband, Adolf, raised three children. World Dairy Expo has benefited from her volunteer services for many years. First, she assisted with the school tours to help educate future consumers. Later she added the role of volunteer in the Purple Cow Gift Shop. Now retired, this Friend of Expo remains busy as an active volunteer in her community while still helping for one week each year at World Dairy Expo. Julie Ehrke of Badger Press was bestowed the Friends of Expo title as well. Julie also grew up on a Wisconsin dairy farm and was an eager dairy enthusiast at a young age. Having been a dairy cattle exhibitor through 4-H and Junior Holstein Association, she developed a devotion to the industry and those people of the dairy sector. During her busy college years at UW-Madison, she dedicated many hours behind the scenes at World Dairy Expo. After graduation, she pursued a career in the print industry and now works for Badger Press of Fort Atkinson. ulie serves World Dairy Expo as the contact with that print vendor and provides regular project support on most print materials including the annual theme artwork. Julie has helped World Dairy Expo to meet quick turnaround project deadlines on numerous occasions. Julie and her husband, Steve and two children reside in Deerfield. Maureen DeBruin of Jefferson has served as a volunteer in a variety of roles at World Dairy Expo for many years. Perhaps the biggest commitment is that of the International Post-Secondary Dairy Cattle Judging Contest manager. Maureen recruits and leads contest volunteers as well as promoting the contest to post-secondary institutions, students and industry sponsors. Maureen supervises in coordinating dairy cattle class selection to the scoring and tabulating of results for both the practical and traditional components of the Post-Secondary Contest. She also assists with logistical requirements for the event as well as the awards banquet. In addition, she is a key member of the Agri-Graphics cattle photography team that captures the ringside photos of each class winner. Maureen has been a Classifier for Holstein USA for 26 years. She volunteers regularly in mentoring local youth with dairy cattle projects.